While taking snapshots from Adobe reader, you might have noticed the reduction in clarity of the output images. Is it possible to increase the clarity or resolution of the PDF snapshots? Yes. 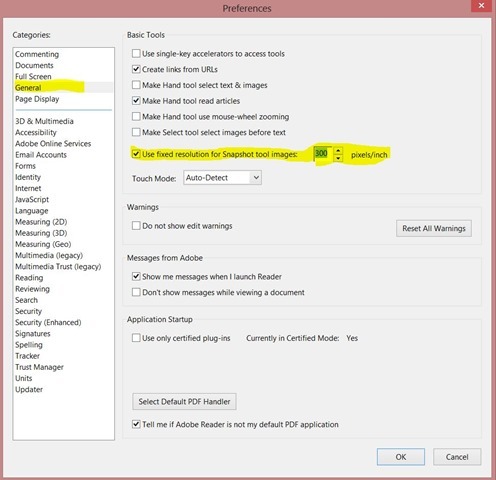 There is an option in PDF reader settings to increase resolution of PDF snapshots, which most of us haven’t noticed yet. I was facing this problem for quite a while, until I decided to dig into the ‘preferences’ of Adobe reader to find the appropriate settings. I increased the screenshot resolution, and after pasting the snapshot into Microsoft word or MS Paint, the quality of screenshot was perfect. 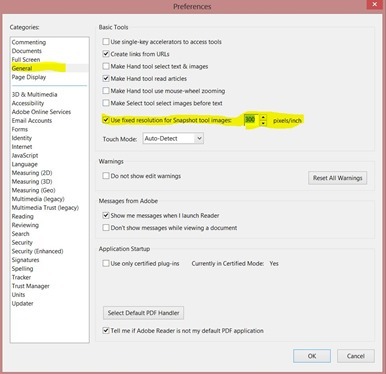 How to Increase the resolution of PDF snapshots. Tick that option and select appropriate pixels/inch value. You can select a value between 1 to 720. For me, a value between 300-400 was working fine. Now open any PDF file and capture snapshot (Edit> Take a Snapshot) and paste to MS word or MS paint. You will find the increase in resolution of the image. If you have any query regarding increasing snapshot quality of PDF reader, please let me know in comments. I did what you said, but it make no difference to the snap shot resolution. I am running Adobe Reader 10.1.9.